First time experiences will often be very special. 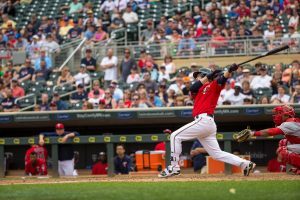 This was the case for Minnesota Twins catcher, John Ryan Murphy, a.k.a. JR or Murph. The conference was held in Atlanta at the Georgia Dome with 25 or 30,000, high school aged, kids from all across the country. He remembers sitting near the top of the arena watching and listening to the music and speakers. John Ryan went to IMG Academy in Bradenton for high school. IMG is a sports academy which actually was founded in 1978 in Beaver Dam, Wisconsin, by long time tennis coach, Nick Bollettieri, as a full time tennis boarding school. It moved to Bradenton and became a multi-sport academy. JR explains, “Mom has been there since day one (in Bradenton) when the only other sport was baseball. But now it is multi-sport. When mom graduated from college, Bollettieri asked her to come work at the academy. She started as a teacher, mentor, and cook. Then she became head of admissions and now is the head of parent/alumni relations.” JR played baseball for four years at IMG Academy, and he graduated from the Academy in 2009. 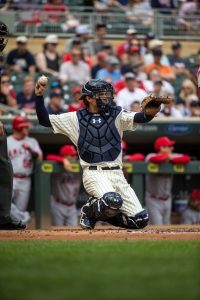 He was drafted out of high school in the second round (76th overall) by the New York Yankees. Murphy, who made his major league debut with the Yankees on September 2, 2013, had a great opportunity to go on a mission trip to the Dominican Republic through Score International while in the minor leagues. It was five days of playing baseball and sharing his faith in Jesus. Each year players pick out walk-up songs when they go to the plate to bat or to the mound to pitch. Murphy had a unique experience last year when his walk-up song was the Christian song “Give Me Your Eyes” by Nashville singer, Brandon Heath. Next post: What is the Shekinah Glory of God described in the Bible?